Wondering just what sort of EMF is lurking inside your "healthy home"? This one minute video illustrates some of the many surprises you can discover about what types of EMF you are dealing with and what your exposure levels are, when you begin to uncover the hidden EMF in your home environment. EMF Remediation by a certified expert is naturally the most thorough way to way to create a healthful home environment free of electronic smog, and simply perusing our EMF Expert Directory will put you in touch with one of our remediation trained and certified EMF Experts in your area. Our Experienced EMF Detection and Protection know-how combined with our positive can-do approach will enable you to achieve EMF (electrical magnetic field) and RF (radio frequency) safety that you can trust, in the full confidence of doing business with a professionally trained certified EMF Consultant. There are many things you can do to safeguard your home from EMF yourself and that is why we have put together several do-it-yourself EMF guides and a 10 lesson video training course, that will show you how to eliminate and/or lower your exposure and therefore the health risks posed by EMF coming into your home from outside sources such as: cell tower radiation, electrical power lines, transportation and airport radiation, as well as from EMF being generated inside your home from such sources such as: wireless technology (cellphones, WiFi, mobile phones etc), transformers, chargers and much more. Each type of EMF requires its own most effective remediation method, and with our new guide we help provide the do-it-youselfer with easy, straightforward solutions to what can sometimes seem to be complicated EMF problems. "EMF Expertise in Action" Self-Guided Online Video Training , designed for the do-it-yourselfer to learn how to detect and protect from EMF in any environment, but particularly in home or office. It is the most convenient course of all the training courses we offer, and also the least expensive. Plus, all the DYI Guides that you see below are included with this training course. Our self guided video training is the fastest and easiest way to learn how to determine the levels of EMF Electrosmog in your Environment AND how to confidently protect yourself and your family from high, and growing, levels of EMF exposure due to our ever more sophisticated technology toys. The good news is that we can learn to live with our toys safely, with EMF-safe knowledge and know-how. This training that will teach you what you need to know right from the beginning - how to reduce your EMF exposure immediately and create a more EMF Healthy Home right now, how to select EMF Meters properly, measure your home EMF accurately, lower your EMF levels and your health risk, and how to properly use the correct EMF protection materials that are right for your situation. 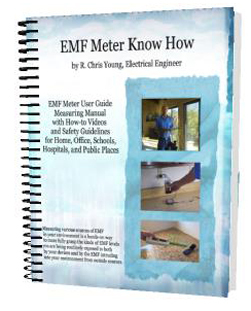 A special feature of this training is that it is ‘upgradable’ in the event you want to pursue EMF consultant Certification training later - 75% of the cost of this training will be discounted from the cost of certification training anytime within a year of the registration date of this self-guided training. 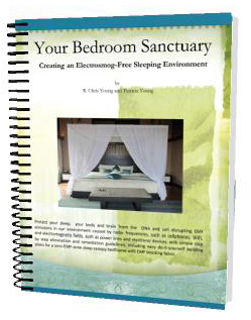 Our"Your Bedroom Sanctuary: Creating an EMF Safe Sleeping Environment" eBook provides illustrated text in addition to easy-to-follow expert video instruction. Your bedroom, and your children's bedrooms are the first rooms you will want to make sure is as EMF-free as possible, since you spend so many hours there each day in such important sleep-time activities involving rejuvenation and repair of body and brain. how to determine your EMF risk, exposure levels, sources etc. 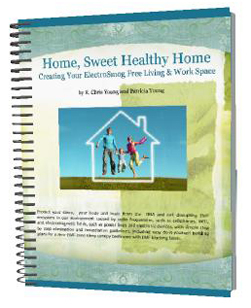 Learn More About "Home Sweet EMF Healthy Home"